I am interested in foxes and owls. They are often depicted in children’s stories in a somewhat mythical manner. Illustrations of them are usually magical and they are both rare enough to the average eye to maintain a mysterious allure. 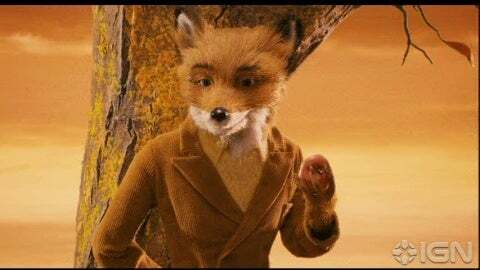 I imagine all foxes are like Fantastic Mr Fox. Sassy and stylish and more than a little bit cheeky. Truly wild animals in all the senses of the word. I also like finishing or replying to statements about people or my self with “like a fox”. If you don’t know what on earth I am talking about, go here to find from where this saying was derived. 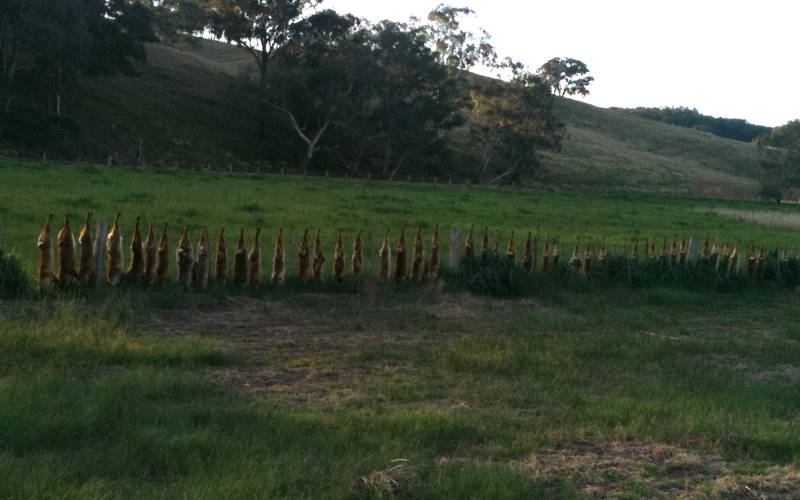 On my way from Bendigo to Daylesford today I saw the most interesting sight. Disturbing to some, fascinating to me. Strung on a wire fence by a road were no less than fifty-five dead foxes. I stopped to take a photo with my phone. I wish I had my Nikon and gotten up close to take a few more pictures. That sounds a bit morbid- photos of dead foxes on mass, but when was the last time you saw fifty-five in a row?! It was like a bizarre modern artwork installation. Of course it wasn’t and I had an inkling of why they were strung up with their tails removed. I showed my father the picture of the foxes and we discussed the why’s and what for’s. The European fox, Vulpes vulpes, was introduced into Australia in the early 1870’s for recreational hunting purposes. The environmental damage they cause is verging on a national disaster. They prey on Australian native wildlife including birds, small mammals and reptiles. Along with mankind’s general habit of dividing and conquering ALL, they are serious contributors to the extinction of many Australian species. They have also caused serious economic damage. Foxes love to dine on lambs, calves (!!! ), poultry, water fowl and goats. To check out the actual percentage of wildlife/other pests/farm livestock slaughtered by foxes, go here. You’d be surprised by what these naughty foxes have been up to over the last 140 years! I have a memory from my childhood of my father and brothers going hunting with rifles and returning with rabbits and the occasional fox. I can recall watching my father hold the main body of a dead fox with his feet while he put the base of the foxtail between two sticks, in a vice like manner. He then quickly drew the sticks upward, skinning the foxtail from the bone. For years the foxtail was attached to our car’s radio antenna. Delightful. The foxes I photographed had their tails cut off, not skinned off the bone, suggesting these foxes were caught for bounty. In the past (not so distant past, actually) money was offered (something in the order of $10 a piece, by my father’s recollections) for a dead fox. The tail removed as proof.